One of autumn's joys is watching the leaves on the trees change color; look at the enduring popularity of day trips (or even longer excursions) just to enjoy this phenomenon. If you're lucky, you can enjoy the show at home thanks to the trees that are already planted. If you think a little more color is needed in your own garden, even a simple walk through your neighborhood can give you an idea of the local possibilities. Then head to the nursery. 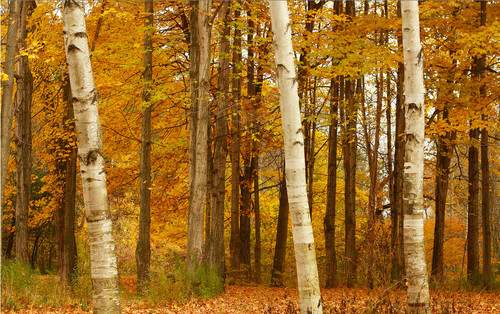 Here are 11 popular trees that are known for their fall color to get you started. They grow in a fairly wide range of climate zones. Some stay fairly small, but some need a lot of room in which to spread out. Local nursery personnel can steer you in the right direction for trees that will thrive in your climate zone, and they can also provide additional planting and growing information for your local conditions. Also check with them for the right planting time; fall may be ideal in warmer climates, but if the soil is starting to freeze already, you may want to wait until spring. Maples. Japanese maple (Acer palmatum) is the showstopper of the maple family, but even if you don't live where it does well (though it's surprisingly durable), pretty much every maple you encounter will provide incredible fall color. And you're in luck — there are maples from as small as 3 feet to as tall as 100 feet that do well in a range of climate conditions, from the colder zones 3 and 4 to the warmer zones 8 and 9. 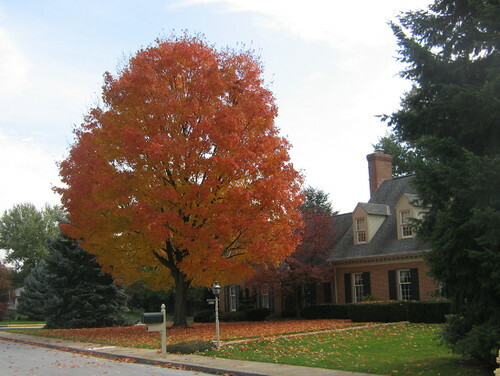 In addition to Japanese maple, favorites include bigleaf maple (A. macrophyllum), paperback maple (A. griseum), Rocky Mountain maple (A. glabrum), red maple (A. rubrum) and sugar maple (A. saccharum). Oaks. 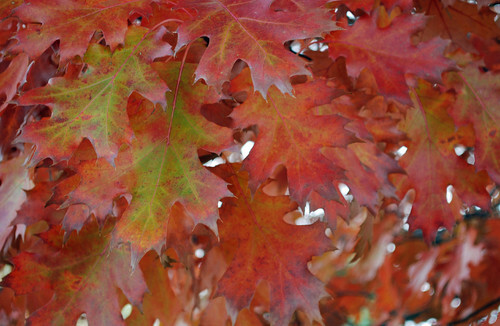 With more than 500 oak species, finding an oak for your landscape is pretty much guaranteed. Finding one with fall color, however, means narrowing down your options. Fortunately, the ones that do well are also readily available and grow well in zones 3 or 4 through zone 8. The large (up to 75 feet tall) and fast-growing bur oak (Quercus macrocarpa) has long, lobed leaves that turn red and yellow in fall. The equally tall red oak (Q. rubra) is relatively fast growing and can spread out to 50 feet. It needs both good soil and moisture, but it has the bonus of doing well in lawns and having roots that are long enough to let you put in a garden beneath it. Expect yellow-orange leaves that will turn to a pleasant shade of brown in the spring. Chinese Pistache. Come fall a Chinese pistache (Pistacia chinensis) can pretty much stop you in your tracks. The foot-long leaves are lined with narrow leaflets that turn bright orange and red, even in desert climates. You'll also have plenty of time to enjoy the color, as the leaves usually hang on for some time after they change. Chinese pistache is a slow grower that's a good choice for smaller spaces in zones 6 though 9. It's fairly drought tolerant but can also handle regular watering if put in a lawn. Eastern Redbud Once the first frost hits, you'll be as impressed by the brilliant fall colors of the Eastern redbud (Cercis canadensis) as you were by its spring blossoms. It's not as large as an oak or a large maple, usually growing to a height and width of about 25 to 35 feet — large enough to provide shade, but small enough to not overwhelm the rest of the landscape. 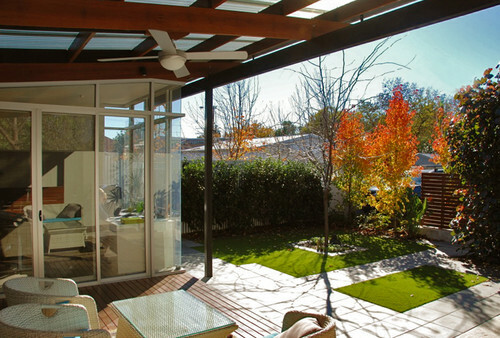 It grows best in zones 4 though 8 and can handle both full sun and light shade. You'll need to provide regular water and good drainage. Dogwoods. Dogwood is another popular landscape tree that's best known for its spring blossoms but also puts on quite a show in fall. Two good choices are Kousa dogwood (Cornus kousa), with red or yellow leaves, and Cherokee Sunset flowering dogwood (C. florida 'Cherokee Sunset') with red-purple leaves. 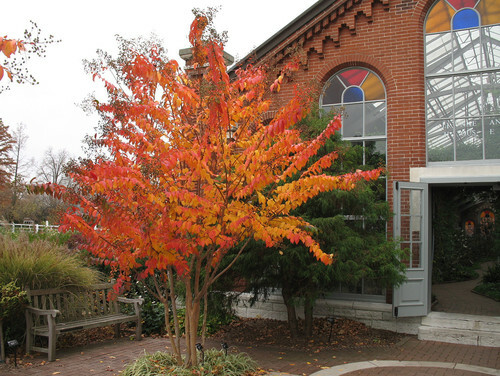 Other popular choices include Cornelian cherry (C. mas), with yellow or red leaves and berries in fall; Pacific or western dogwood (C. nuttallii), with yellow-red or pink fall foliage; and Stellar dogwoods (C. Stellar series), known for outstanding shades of purplish red. Dogwoods grow in either full sun or light shade, with moderate to regular water, in zones 3 through 9, depending on the species. Ginkgo. Most people these days know the supplement, but the maidenhair tree (Ginkgo biloba) is a longtime landscape favorite. It's versatile: tall enough, at up to 50 feet in height, to serve as a street tree but equally good as a patio tree. Even better, it's very long lived and relatively drought tolerant, has almost no pests or problems, and can handle pollution and other environmental issues. 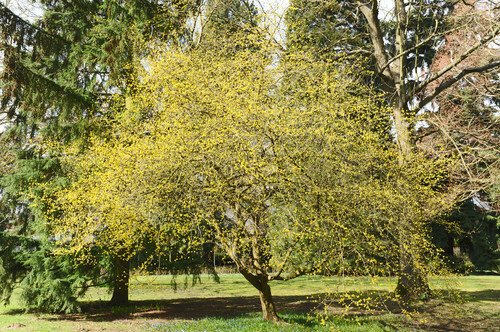 Most of all, it's a beautiful tree with lovely fan-shaped leaves that turn bright yellow-gold in fall. 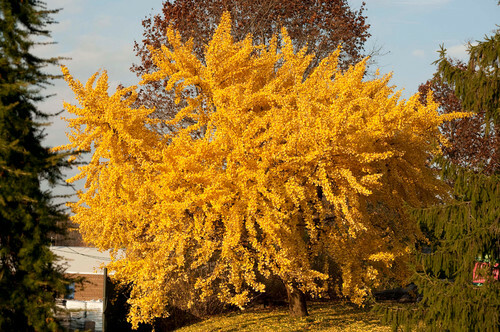 Ginkgo grows well in zones 3 through 8 in both full sun and partial shade. It needs well-drained soil and regular water until it's established. Crape myrtle. The showy summer flower clusters are generally the first feature people remember, but its red, orange or yellow fall leaf color is another excellent reason to grow the versatile crape myrtle (Lagerstroemia). It will nestle into smaller spaces, such as alongside patios or in front of entries, in zones 6 through 9, reaching only 35 feet tall. There are a number of varieties available, but your best choices are probably L. indica or the hybrids, which have better disease resistance. Grow them in full sun and provide moderate water once established. Tupelo or sour gum. It takes a long time for this U.S. native to reach its final height of up to 50 feet. If you’re willing to wait, you’ll have a great shade tree that grows well in full sun or partial shade and rewards you with shiny leaves that change from yellow and orange to bright red. Tupelo (Nyssa silvatica) prefers plenty of moisture and acidic, well-draining soil and doesn’t handle pollution well. It also doesn’t transplant well; plant it in its final location. River birch. This fast-growing and graceful tree can reach up to 90 feet tall and 60 feet wide, taller than its better-known white birch cousins. Along with yellow fall foliage, it'll reward you with interesting bark, and there is even a weeping variety. River birch (Betula nigra) grows in zones 4 through 9 and prefers full sun and regular water. Callery pear. This isn't as well known as its fruiting cousins, but when it comes to fall color, you can find varieties with colors ranging from yellow to red to an almost purple hue. Callery pear (Pyrus calleryana) is relatively tall, reaching about 50 feet. It produces fruit, but the fruit isn't edible. Grow it in zones 5 through 9 and provide full sun and moderate to regular water. Japanese persimmon. 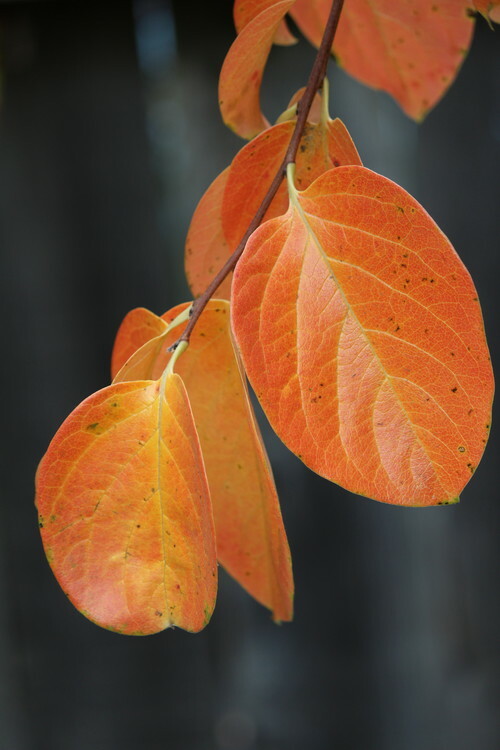 If you live in a warm-winter climate and despair of having the strong fall colors of colder climes, consider Japanese persimmon (Diospyros kaki). Come fall the leaf colors are shades of yellow, orange and red to match the color of the fruit, which will hang on even after the leaves drop. This is not a large tree, generally only 30 feet tall and wide, but the color and fruit more than make up for any lack of size. It's a good choice as a shade tree as well. Grow it in zones 7 through 10 in full sun. Let the soil dry out between waterings.